Whether you’ve been learning about microfluidics here at Microfluidic Future or somewhere else, you’ve undoubtedly come across the elastomer poly(dimethylsiloxane) (PDMS). PDMS has radically changed the capabilities of microfluidics (and its price tag) since it was first brought into microfluidics by George Whitesides in 1998. PDMS has effectively replaced glass and silicon which were borrowed from existing micromachining industries. PDMS has great resolution and can contain sub-0.1 µm features. But how is PDMS used, and what makes it so great? Hopefully you’ll have these answers by the end of this post. Soft lithography is a widely used technique to create PDMS structures. This process first requires a mold, or a master, generally produced by photolithography. 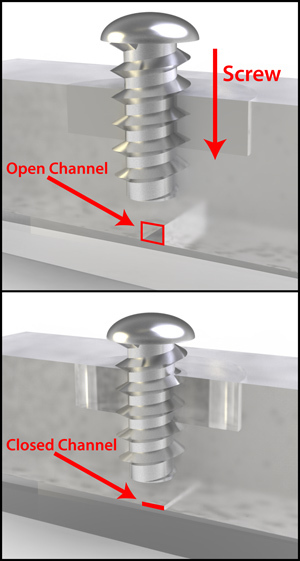 The mold must represent the hollow space of the microfluidic chip, where the fluids will eventually flow. PDMS is formed by mixing one component which contains silicon hydride groups and another component which contains a vinyl group. This mixture is then poured on top of the master. 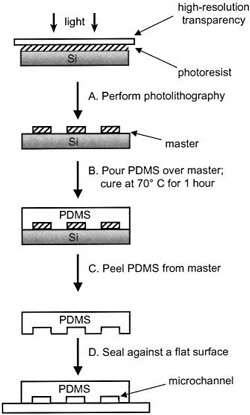 PDMS cures to a solid after an hour at 70o C, and can then be peeled away from the master without damage to either part, allowing the master mold to be reused. The earlier steps can be completed within 24 hours, and replicas can be mass produced after designing and creating a master. After removing the PDMS replica, we have an open space in the structure from the master, but our channels have no bottom! We next have to seal the PDMS to another surface, such as glass, silicon, or itself. More importantly, PDMS can be sealed reversibly or irreversibly. Van der Waals forces allow reversible sealing to smooth surfaces. This seal is airtight, but can only withstand pressures around 5 psi. Adhesive silicone or cellophane tapes can also be used to create a reversibly seal that is stronger than PDMS alone. Reversible seals allow for reuse or added functionality. Remember that the PDMS used in the SIMBAS lab-on-a-chip was sealed reversibly to the glass, allowing reuse or future analysis. In some cases, a lab-on-a-chip may require an irreversible seal, especially if operating under higher pressures. PDMS can be irreversibly sealed by exposing it (and possibly the other surface) to oxygen plasma. However, the two pieces of chip must be aligned within a minute or else the oxidized PDMS surface will reconstruct in the air. Complex structures can be created by “sandwiching” multiple layers of PDMS. Furthermore, additional components like membranes can be included in this sandwich. This can be a bit of a challenge depending on the complexity of the features, and micro-stages have been created to ensure perfect alignment after oxidation. Alternatively, PDMS can be sealed with the aid of polar solvents. A thin film of a polar solvent is placed between PDMS layers and then heated, evaporating the solvent and sealing the layers. Instead of using photolithography to create the mold, 3D printing can also be used. 3D printing prints small globules of material according to a CAD file to make 3D structures. 3D printing itself has been growing in capabilities due to its extremely quick prototyping speed. It can achieve a resolution between 50 and 100 µm, which is suitable for microfluidic devices. This mold would then be used in the same way to create PDMS replicas. Microfluidic chips can be very complex, featuring pumps, valves and mixers. These parts can easily be implemented in a PDMS structure. Mixers can be incorporated into the masters, transferring them to the floor of a channel. Other parts that are made separately, like some of the microvalves I discussed previously, can be placed in the PDMS while curing. This allows a single master to be very versatile while moving independent features about the device. Here are some key features of PDMS adapted from “Poly(dimethylsiloxane) as a Material for Fabricating Microfluidic Devices” by Whitesides. Some clear advantages and unique properties can be seen from this table. I would also like to point out some additional advantages and disadvantages. Elasticity restricts aspect ratio of structures as sagging/shrinking can occur. Seeing really is believing. How often can we tell what a liquid is by just looking at it? Not too often. Sure, you might be able to tell when you definitely smell something sulfurous, or have a slippery base and I hope you can pick out milk. But we’re not always that lucky, especially if you’re dealing with something you really shouldn’t be touching or directly smelling. There are a ton of tests we can run to pinpoint what it is and you often need a pro to decipher the results. Ideally you could just read it with your eyes. With a batch of research from Harvard University, we’re one step closer. The paper entitled, “Encoding Complex Wettability Patterns in Chemically Functionalized 3D Photonic Crystals” was featured in the August issue of the Journal of the American Chemical Society. The lead authors Ian B. Burgess and Joanna Aizenberg, of the Wyss Institute, propose a process to functionalize crystals so that they can differentiate between different fluids. First, these aren’t just any of crystals. These are 3D porous photonic Inverse Opal Films (IOF). They were carefully created to maintain a specific structure. The ability to discern between different fluids is possible due to selective application and erasure of different chemicals. First, a functional group is applied to the surface of the IOF. A slab of PDMS (a silicon-based polymer) is sealed to an area of the IOF. O2 plasma is applied and erases the functional group except the area covered by the PDMS. This can then be repated with a second functional group, and so on and so on. There can even be overlapping areas covered to give you exactly what you need. But what’s the point of functionalizing the surface? Well the functionalization affects the wettability of the IOF. Given the surface’s wettability and the surface tension of a liquid, the liquid won’t be able to penetrate the channels. There can be a clear change of color in the infiltrated regions. The authors refer to their system as Watermark-Ink (W-Ink) and suggest that it could be used as security measures. But I think I’d rather see it used in microfluidics. While you may toy with the notion that you could selectively choose which fluids flow through certain channels and partake in reactions, I think it is most useful as an indicator. 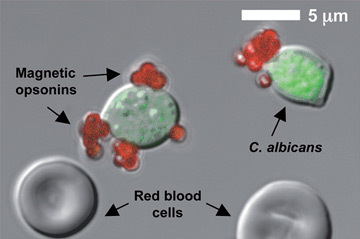 Many microfluidic devices are intended to be used as point-of-care (POC) diagnostics. A sample is analyzed for a certain component that would indicate something about the patient's health. But at the end of the test, you have to be able to tell if the reactions were positive or negative. I think that the test could be designed to produce two fluids with different surface tensions, depending on the outcome. Then, one of two shapes would appear. It would require no confocal microscope or camera, and certainly wouldn’t need translation.